At age three Mozart began to play the harpsichord. At five he was composing his own music and at six he began touring Europe, performing for royalty and causing a sensation wherever he went with his astounding musical abilities and becoming known as "the most kissed boy in Europe." Bobby Fischer won the U.S. Open Chess Tournament at age 14 and qualified as an international Grandmaster at 15.Pablo Picasso started producing works of art at the age of 8. The examples above are children so extraordinarily gifted that they are usually known as prodigies. They represent the peak of the spectrum of giftedness, a term that is usually used more broadly to describe children of high intelligence or talent. But parents and teachers who are looking for a precise definition of what giftedness is and a means to determine which children are gifted, are apt to be disappointed. There are over 180 different definitions of the concept and no generally accepted standards by which potential giftedness can be assessed. In the UK, the Department for Education and Skills identifies gifted learners as those who have particular abilities in one or more curriculum subjects and talented learners as those who have particular abilities in the creative arts and PE. The whole concept of giftedness has been around for about 100 years and assessment of intelligence by standardised IQ tests has always been seen as important. It seemed at first that gifted children could be defined as those who score above a certain quotient. But over the last 50 years, there has been a growing recognition that in both childhood and adulthood, other factors interact together with intelligence to determine performance level in a number of activities. Very few highly successful people in any field of endeavour are in the top 2% of the IQ spectrum, but most are in the top 5-20%. So intelligence alone is not enough. Other important factors include personality traits like tenacity, ability to overcome setbacks, initiative and motivation, interpersonal skills like self confidence, and environmental factors, like the level of support and encouragement received from parents and teachers. What's Going on in the Gifted Child's Brain? There have been suggestions that gifted children may have greater specialisation in brain areas that control motor behaviour and increased communication between the left and right sides of the brain. Indeed, many gifted children have a tendency to be ambidextrous. But so do many non gifted children. In the cases of motor skills in gifted young athletes and musicians, it’s a case of "which came first, the chicken or the egg?" 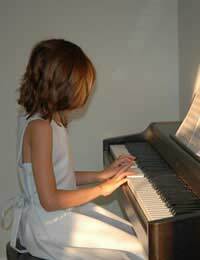 Were they born with greater skills than most, or did they develop them with intense practice? Child prodigies with amazing mathematical capabilities are known as human "calculators". They can perform phenomenal tasks like multiplying 30 digit numbers in their heads. Recent studies of MRI scans of the brains of such individuals have apparently shown six to seven times the typical blood flow to parts of the brain observed to be active during mathematical operations. What is it Like to be Gifted? At first glance, it may seem that a gifted child and his family are in for an easy ride through life. But in fact, giftedness may bring many trials and tribulations. Often social development does not keep pace with cognitive development. This is known as asynchronous development and gifted children may have difficulties making friends, become victims of bullying and develop a feeling of being a constant outsider. Children can be very cruel to anyone perceived as a "smart alec" or "teacher's pet". A gifted child who recognises this may spend his school career trying to dumb himself down, stay under the radar and not get noticed. By doing so, he may avoid bullying, but he may never be challenged intellectually or achieve his potential. Some gifted children excel in a formal school setting, so they are identified and receive appropriate attention. Others, despite exceptional talents, may not respond well to discipline and classroom learning, so their abilities may be unrecognised, and boredom and frustration may lead them to disruptive behaviour. Asynchronous development may also manifest itself in other ways, like an advanced intellectual understanding of moral and ethical issues, together with emotional immaturity and inability to cope with the understanding. Such children may be particularly sensitive to and upset by exposure to shocking events like news stories about wars, poverty and violence. Nobody knows why some children are so clearly talented from the cradle, while other towering adult geniuses seem to be late bloomers. For example, Einstein famously spoke late and his parents are said to have feared that he was below average intelligence. So take heart if your child is not yet a chess grandmaster, is not writing symphonies or painting masterpieces. She may yet turn the world around with her adult achievements.